Taking some inspiration from these super cute olliblocks, I made some Book of Mormon Swap blocks! You can print these out and glue them to one inch blocks, but since I want to use these in Sacrament Meeting and not be super loud, I turned them into magnets! 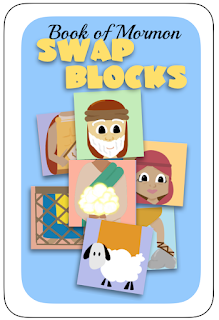 First, download the swap blocks here. Then just print, cut, stick to 1" magnetic tape, and cut again. Then, to make these super portable, and as well as have a surface to play on, (You know, if you actually get to sacrament and don't sit on a metal chair ) I put them all in a cute little altoids tin. Voila! P.S. If you like these, check out my General Authority Swap Blocks, too!